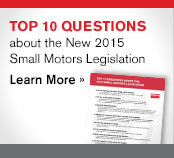 Enacted by the U.S. Department of Energy, the 2015 Small Motor Legislation requires motor manufacturers to stop producing motors that do not meet the new efficiency standards by March 2015. This legislation affects small general-purpose motors between 1/4HP–3HP, with an open construction and NEMA design. 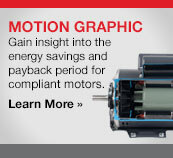 • Increased Efficiency - New motors have been designed to help reduce energy consumption and save you money! • Finding Your New Motor is Simple - When you replace your existing, pre-legislation motor, you will be purchasing a different SKU. 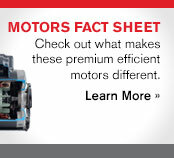 The new SKU will be listed under “Alternatives” when you search for your pre-legislation motor on Grainger.com®. • Limited Supply of Pre-Legislation Motors - After March 2015, pre-legislation motors will no longer be produced, so supply will be limited after this time. • The more efficient, cooler-running motor along with the Class H wire, Class F insulation material and Class F lead wires helps provide a longer-lasting motor. • Increased winding size provides a cooler running motor, improves efficiency, extends bearing life and reduces motor insulation degradation. • Run capacitor provides winding with increased energy to help improve efficiency. • Tighter machining tolerance between the stator rotor reduces magnetic flux losses. • Some motors may be longer and include an additional capacitor (cap start/cap run) to increase efficiency. 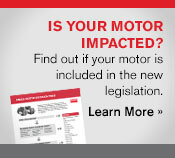 Look for this icon that indicates a legislation-compliant motor when you search for your pre-legislation motor on Grainger.com®. and easy. Check out the information below to learn more about this legislation and how we can help.